You can now view our May 2016 newsletter online. Please click the image below for the larger version. I am a subscriber to The Mineralogical Record, and look forward to every volume. I also like the extras that are often included, such as “What’s Hot in Tucson,” “What’s Hot in Munich,” and the Dallas Symposium DVDs. In the 2015 Dallas Symposium DVD, Tom Moore from the Mineralogical Record was one of the speakers, and he introduced a new and exciting project he has been working on for many years. 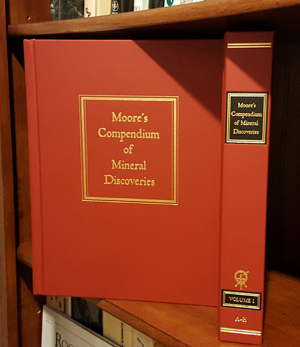 The new project, titled “Moore’s Compendium of Mineral Discoveries," is an exhaustive guide to every documented mineral discovery since 1960 of specimens with crystals over one centimeter. In Moore’s presentation in the DVD, he describes the multitude of sources that he used for the compendium. Certainly, no mineral locality index this ambitious has been created in modern times. All sources are researched, and details of the mineral occurrence and habits of each location are documented. At the Tucson show this year, I visited the Mineralogical Record booth at the Convention Center show, and got my first looks at this impressive guide. It contains two volumes, with a combined page count of 1,644 pages. Holding it and flipping through it gave me the incentive to buy it immediately, despite its hefty price tag. I felt that this compendium would be a great resource for researching new minerals that I add to the Minerals.net database. Because there were only 500 volumes printed (with more than half already sold,) and the editor not planning on producing a second edition, I felt it was an opportune time to purchase it. I had to schlep these extra heavy books in my luggage returning from the Tucson show, in addition to my rocks. I was given a 50 pound limit by the airline for my luggage, and lo and behold my suitcase weighed exactly 50 pounds! However, the extra schlep was well worth it, because aside from the workout I got tugging these in my suitcase, I do use these books all the time now. It is a very worthy investment, and it's important to get these now before they run out and are no longer available. I do have some criticism, though. I feel that in today’s technological age, such an important piece of work should be available in a digital format that is fully searchable and indexable by locality. Additionally, there could have been a way to include photos in such digital version. One more area of critique is the preference over certain localities and the omission of others. For example, in Northern New Jersey, one would get the impression that Fort Lee was the most significant locality in the area, whereas in reality Paterson and Prospect Park were much more prolific, but don’t receive quite as much attention as Fort Lee.